On a winter’s day in 1904, Sherlock Holmes author Arthur Conan Doyle steered his motor car too quickly into the drive of his Surrey country home. The car clipped a gatepost and ran up a high bank before overturning, pinning him beneath it. When the steering wheel snapped under the strain, the entire weight of the car was borne by Conan Doyle’s back. There he remained until a crowd assembled and lifted the car off him. ‘I should think there are few who can say they have held up a ton weight and lived unparalysed to talk about it,’ he would later recall. 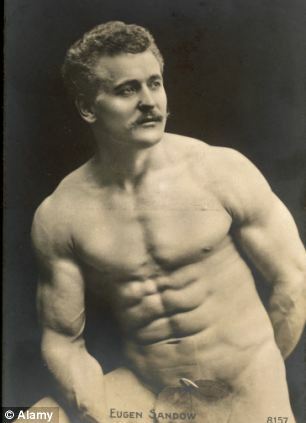 He attributed his narrow escape to a course of muscular development he had undertaken with Eugen Sandow, the world-famous strongman and music-hall performer who provided personal fitness coaching from his Institute of Physical Culture at 33a St James’s Street, in the heart of London’s fashionable clubland. 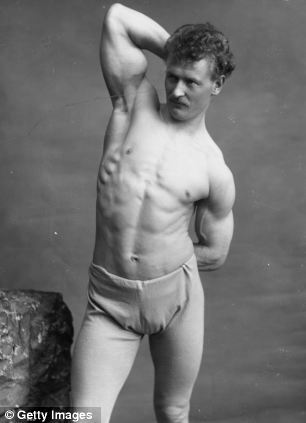 By the time of the accident, Conan Doyle had been following Sandow’s training methods for several years, a regime that had left the novelist in superb physical condition. Over those years, the two men had become firm friends, so much so that in 1901, Sandow had invited Conan Doyle to be one of the three judges at what he called ‘the great competition’ — the first national bodybuilding contest to be held in Britain. It was to prove a remarkable occasion. As the Royal Albert Hall was plunged into darkness, spotlights picked out the 80 competitors — clad only in tights and leopardskin leotards — making their way to the stage, flexing their well-developed muscles and performing displays of gymnastics to roars of approval from the crowd. After a long evening of posing and judging, William Murray from Lancashire was declared the winner and was presented with the coveted prize: an allegedly solid-gold statue of a naked Sandow holding a barbell. The competition had been hugely popular, capturing the attention of rich and poor alike, and Sandow gave the proceeds of the event to a charity supporting the widows and orphans of those killed in the Boer War. It was a gesture typical of a generous man who would go on to sponsor the 1908 London Olympics and provide financial support for Ernest Shackleton’s expedition to the South Pole. Eugen Sandow had become a pillar of the establishment, and — though forgotten now — one of the most admired men in the country, single-handedly changing the way Britons thought about physical fitness. It had all been very different when he arrived on these shores in 1889, aged 22. Later in life, Sandow was not above embellishing his early years, making it difficult to know where truth ends and fiction begins. But it seems Britain’s first modern bodybuilder was born in the then Prussian city of Konigsberg on April 2, 1867. He was almost certainly illegitimate and adopted by a family called the Mullers in early infancy. Whether that was the truth or a convenient form of self-promotion for a man growing rich on the idea of physical transformation is unclear. But what is certain is that the moment of his true calling came when his adoptive father took him on a trip to Rome when he was 15, where he saw the classical statues of ancient wrestlers and deities. Already a regular at the gymnasiums in Konigsberg, the teenage Sandow returned home, redoubled his efforts and dedicated himself to achieving ‘the utmost notion of perfection’. He spent all his free time at the gymnasium or pitting his growing strength against the professional strongmen at the circus. 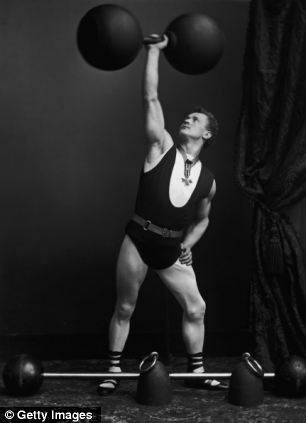 At the age of 18 — presumably to avoid a gruelling five years of Prussian military service — Sandow made a life-changing decision: to leave his family behind and begin a new, impoverished life, travelling the capitals of Europe as a music hall strongman, circus performer, artists’ model and professional wrestler. It was while he was wrestling in Italy — most probably in the spring of 1889 — that he emerged, one fateful day, from the sea on Venice’s beaches. His appearance immediately transfixed the Anglophile-American painter Edmund Aubrey Hunt, who stopped to compliment Sandow on his ‘perfect physique and beauty of form’. Aubrey Hunt suggested Sandow might exploit his physique to find fame and fortune in London. Within months, a plan had been hatched and Sandow had travelled to Britain. His appearance at the Royal Aquarium Music Hall in Westminster in 1899 was a sensation. He arrived dressed in full evening attire and wearing a monocle, an unlikely looking figure — he was just 5ft 9in — to take on two professional strongmen, Charles Sampson from Alsace and Franz Bienkowski, aka Cyclops, a bull-necked 19-year-old from Hamburg. If he beat both men in assorted weight-lifting trials, Sandow stood to win a life-transforming £600 (worth £50,000 today), but when he tripped over the weights on the stage, the crowd — already laughing at his relative shortness and elaborate attire — clearly didn’t consider him a serious contender. Then, all of a sudden, Sandow ripped apart the front of his evening suit and the shirt beneath to reveal all 15 stone of his magnificently muscled body dressed in athletic tights. The crowd was silenced and, in due course, Sampson and Cyclops were defeated. Sandow, who reportedly concluded the show by lifting a 500lb stone block with just his middle finger, became one of the biggest stars in Victorian London. Within a year, it was reported that when he appeared on stage, ‘semi-delirium seized the delighted dames and damsels . . . when he made the mountainous muscles of his arms wobble’. For more than 20 years he could do no wrong. His personification of the twin ideals of power and beauty were tailor-made for an era when concern over the physical degeneration of the population, particularly among the working classes, was at its peak. It was felt that the sheer pace of modern life and growing urbanisation — by then almost three- quarters of the British population were living in towns and cities — was having an adverse effect on the health of the nation. By contrast, Sandow’s extraordinary physique, with its perfection worthy of a classical Greek statue, showed what the human body was capable of. 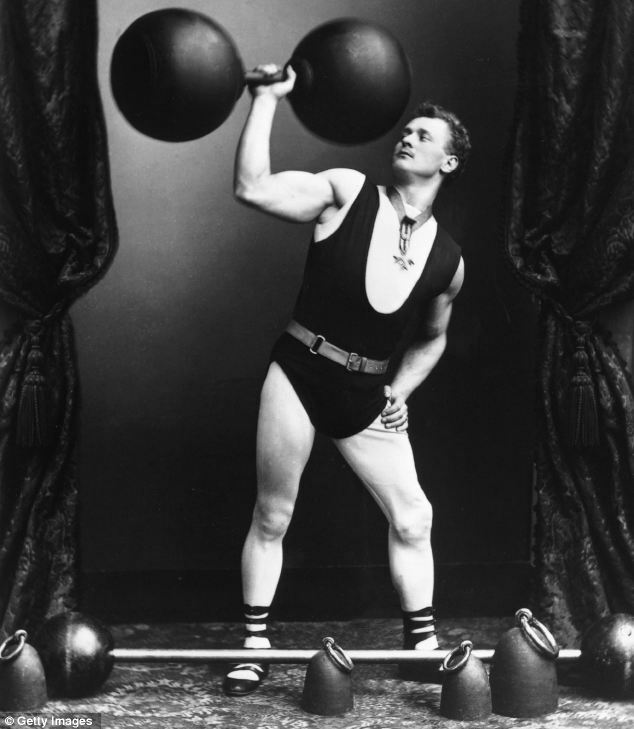 His touring shows, which saw him lifting huge, hollowed-out dumbbells that contained a man in each sphere, or bearing the weight of a horse and rider on his chest, played to crowds in Britain and abroad. In 1897, he set up the Institute for Physical Culture in St James’s Street, a forerunner to modern gyms, keen to spread his message of physical self-improvement and to make even more money. Sandow was a natural entrepreneur and rarely missed an opportunity to increase his wealth. On his first tour of the U.S. — where society ladies paid up to $300 each to run their hands over his muscles in the privacy of his dressing room — he was earning almost $3,000 a week, a fortune for the time. 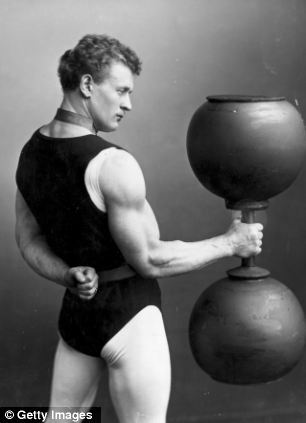 Sandow was no charlatan: his method of muscle-building — his ‘system’ as he called it — relied on multiple repetitions of particular exercises using relatively low weights, and is considered as sound today as it was 120 years ago. And it worked — for men and, to a slightly lesser extent, women — enabling Sandow to open more institutes, set up his own magazine dedicated to physical fitness and to sell dumbbells and other special types of equipment. With his stage career also flourishing, the money rolled in. Sandow married Manchester-born Blanche Brookes, by whom he had two daughters, and bought a smart townhouse in London’s Holland Park. But he was a great philanthropist, too, working with the Church Lads’ Brigades and volunteering to use his exercise regime to improve the physical fitness of those volunteering to fight in the Boer War. He took British citizenship in 1906, and was appointed Professor of Physical Culture to George V in 1911. As World War I approached, Sandow offered to work on the physical fitness of those volunteering to fight against Germany. 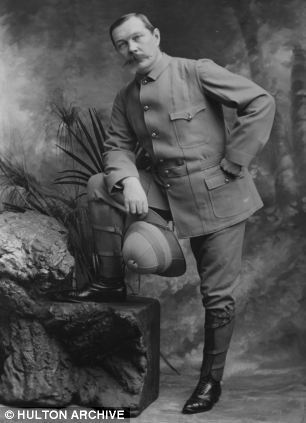 But at a time when any association with Germany became unacceptable, not only did Sandow’s Prussian origins come back to haunt him, but a misguided and very expensive diversification into chocolate and cocoa powder (he claimed health benefits for both) brought accusations that he relied on German technology and ingredients. In a matter of months — and amid malicious reports that he had been executed as a German spy — Sandow’s business empire collapsed. The great showman would spend the rest of his life in comparative obscurity, and with his once considerable wealth drastically diminished. He kept on his St James’s Institute, where an American visitor in 1924 was surprised to find him alive and, at the age of 57, looking 15 years younger and still in excellent physical condition. But within months, just like his famous pupil Conan Doyle, he was involved in a road accident in which his car overturned. Though he survived the accident, he died several weeks later. His doctor, Sir Thomas Horder, maintained Sandow had suffered an aortic aneurysm brought on by the accident. Others have claimed that perhaps his heart had been weakened by resorting to steroid abuse — a practice that was gaining ground — as his career neared its end. Either way, Sandow was quickly forgotten. It wasn’t until a new generation of bodybuilders rediscovered him in the Sixties and Seventies that the pioneering Prussian’s contribution to bodybuilding and physical fitness began to be acknowledged.